On Saturday, 30th November 2013, a WBU Europe Championship double header will top the bill, on the Dave Murphy Acourtier Events promoted WARZONE event, which takes place at York Hall, in Bethnal Green, London. Main bout of the night will see former WBO and IBF Inter-Continental Light Heavyweight Champion Mark Prince, against a yet to be named opponent, for the vacant WBU Europe Cruiserweight crown, whilst the co-headliner sees the inaugural WBU Europe Women’s Super Bantamweight title, being competed for by London’s Marianne ‘Golden Girl’ Marston against Bulgarian #1 ranked Galina Gumliiska. Prince, who has a formidable record of 20 wins (16 KOs) and just the single loss, against long time WBO World Champion Dariusz Michalczewski, will be making his first challenge for Championship honors, since returning to the ring earlier this year following a fourteen year sabbatical. Whilst an opponent has yet been announced for Prince, promoter Dave Murphy has gone on record stating that he is looking for a top fifty ranked opponent for Prince, as he intends to move the North Londoner into World title contention as quickly as possible. This seemingly brash statement should come as no surprise, as Prince has competed at the highest level previously and judging by his sensational fourth round stoppage win, over Czech Republic’s Jindrich Velecky on October 4th, anything less would not present a challenge for the former World title challenger. Speaking earlier, at the famous TRAD TKO Gym in London - where he was to watch co-headliner Marianne Marston sparring former British and European Bantamweight Champion Ian ‘Dappa’ Napa - an elated Prince could barely contain the excitement, of being back on the Championship trail. 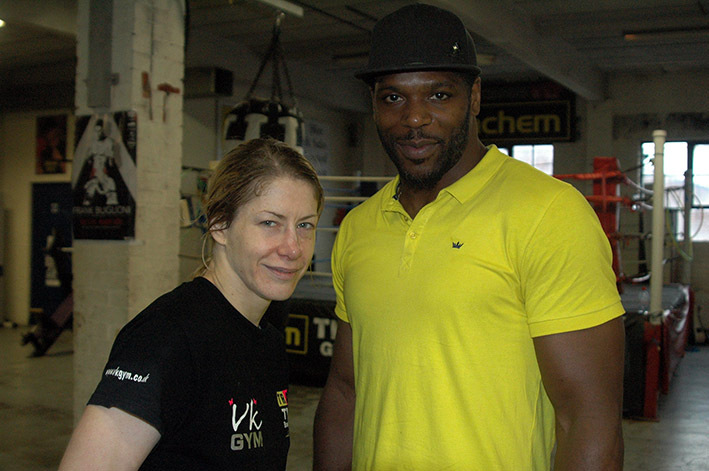 “I’m really excited to be fighting for the WBU Europe Cruiserweight title, really excited. I suppose it’s a bit surprising for people, because I’ve had just the one fight, coming back after fourteen years out and I’m fighting for a title already, but I’m more than capable to do such things, because the level of fighter I am. I’m very different from most fighters, a lot of fighters couldn’t come back and demonstrate the power and skills that I have. The Co-headline bout is the aforementioned Marianne Marston versus Galina Gumliiska. Marston, the protégé of the late, great Heavyweight Champion of the World, Smokin’ Joe Frazier, has only competed twice in the pro ranks, both times stopping her opponent in the first round. Whilst Marston may have just fought just twice, her opponent, Galina Gumliiska, has a wealth of experience and has fought twice for the World title, as well as six further European, International and Inter-Continental Championship fights. Whilst Gumliiska wasn’t available to talk about the upcoming fight, Marston was and she took a little time off after her previously mentioned sparring session, to talk about the upcoming fight. “I’m really honored to be fighting for the WBU Europe title. However, to me this fight isn’t about the title, it’s about me being a boxer, winning the title will be the cherry on top. I am so pleased to be fighting Galina, she has been in with the best in the business and is one seriously tough cookie. No disrespect to Gabriella (Roman) or Katalena (Lazar), they both stepped in at short notice for our fights, after injuries and pullouts by my original opponents, but I want to fight tough credible opponents. I came into the sport late, even later than planned thanks to the prejudice and politics of the BBBofC, but I’m here now and intend to make up for lost time. Mark Prince, against a yet to be named opponent, for the WBU Europe Cruiserweight title and Marianne Marston versus Galina Gumliiska, for the WBU Europe Super Bantamweight title, that co-headline the Dave Murphy Acourtier Events promoted ‘WARZONE’ Xtreme Combat event, that takes place at York Hall in Bethnal Green, London on Saturday, 30th November 2013. Tickets, priced £35 (Standard Seated) and £60 (Ringside) are available on-line at www.acourtier.com and www.tkoboxoffice.com For further information call – 07960 850645, 07809 499896 or 07557 641597.